A collaborative project between LANDac, CIFOR, Food & Business Knowledge Platform, Shared Value Foundation and in-country partners. Read more about experiences from the field in the blog! The final synthesis report is available now! In debates around land-based investments, much attention has been given in recent years to making investments more inclusive and sustainable, including raising companies’ Corporate Social Responsibility profile. In approaches of ‘inclusive business’ or ‘shared value creation’, use of multi-stakeholder processes has been on the rise. By bringing together different stakeholders and exchanging views it is the aim of these approaches to make businesses more inclusive and sustainable. However, what is less clear in the existing processes is how local stakeholders are represented in the discussions: including diversities and dynamics at local level, existing expectations, livelihood priorities and engagement with the businesses. Moreover, impact analyses tend to be biased towards economic impacts (namely job creation) and environmental impacts of the investment, while often mostly looking at those groups that are directly affected, but only to a lesser extent taking into account people that live near the investment but are not directly involved in the business model. With the goal of including local context in multi-stakeholder processes, this collaborative project will organize three learning platforms on land governance and food security in which local knowledge and bottom-up fact finding is combined with multi-stakeholder learning and dialogue, accompanied by follow-up activities for implementation and monitoring. We will focus on concrete investments in Tanzania, Mozambique and Uganda: countries that are receiving large-scale land-based investments. The countries have been selected on the basis of a mix of criteria: the quantity of the investment flows, opportunities for making a change (Dutch and European stakeholders), as well as existing opportunities for linking up with ongoing research, practice and existing initiatives. The main thrust of the platforms consist of mapping local context around specific investments, in close collaboration with local monitors. The research outcomes will be brought into 3-day learning meetings with businesses and other local stakeholders. The learning meetings will lead to the identification of actions that can contribute to better aligning the investments with the local context. 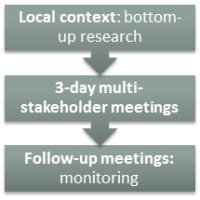 In the remainder of the year several (shorter) follow-up meetings with the stakeholder groups will be organized, to ensure that the change processes are monitored. By starting the learning platforms – with bottom-up research into the diversity of local context – this project aims to better align the investments with local priorities and expectations while starting an open exchange about innovative approaches to improve impacts locally. Communities will have better information about the investment, while investors will increase their knowledge about what is happening in the area, including business risks and opportunities.